My family and I did so many things this weekend. It was really something. We haven’t been this busy for a long time. I want to tell you about parts of it, but right now my eyes feel kind of scratchy when they’re open and if I close them for too long and then try to open them, they blow up all red and stuff, so I think maybe I should go to bed. Still, I would like to try to entertain you in some manner or other. Per usual, I will let my children do it for me. We went to DC this weekend to go on a Duck Tour with my friend Tracy and her daughter who were visiting DC. If all goes as planned, you will hear about that tomorrow. 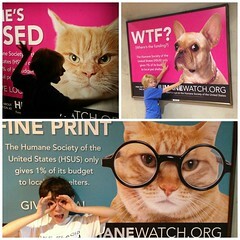 Today, I will tell you about the Metro trip into DC and how an organization called Humane Watch has plastered brightly colored ads featuring funny animals all over the DC-area subway system. Naturally, my children were delighted and made me take photo after photo of them with the ads—AND the vaguely PG-13 headlines on them. Frankly, if my kids didn’t already regularly get in trouble at school for saying things like, “I’m pissed,” and “WTF?” I’d probably be annoyed at the ads. Fortunately, my kids have a bad influence in their lives (me) and already know these words so I don’t have to be all irate about the ads. Thank goodness, because righteous indignation is exhausting. Jack did take to scripting, “WTF? WTF? WTF?” for the duration of our ride on the Metro, which was GREAT. As it stands, we mostly just laughed uproariously at the ads and I got to explain exactly what “She’s pissed,” means and why it might not be appropriate to say it in front of adults or other impressionable children. So goes another train ride with Team Stimey.